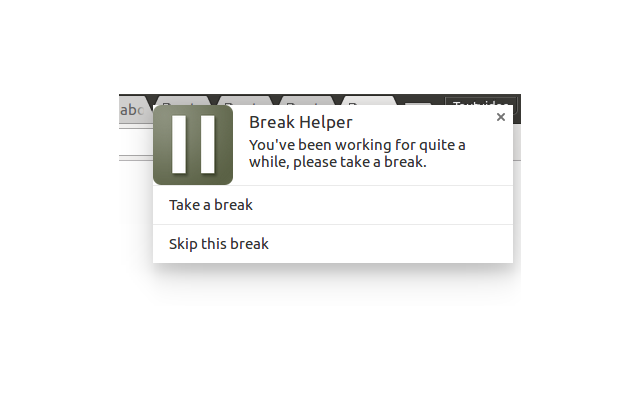 Several years ago I made a simple extension for Google Chrome called Break Helper with the intent of having a tool that constantly reminds me to take a break. However, for the past year BH has been slightly broken due to changes in Chrome notifications mechanism. Previously raw HTML notifications were allowed, but that API has been long deprecated in favor of Rich Notifications, which are a bit more rigid and less powerful - you couldn’t have any buttons, JS code running in the notification, and only raw text was allowed. I recently noticed that support for notification buttons has been added, as well as a mechanism to update existing notifications, that allowed for some much needed changes to BH. In simplified version there were no confirmations. 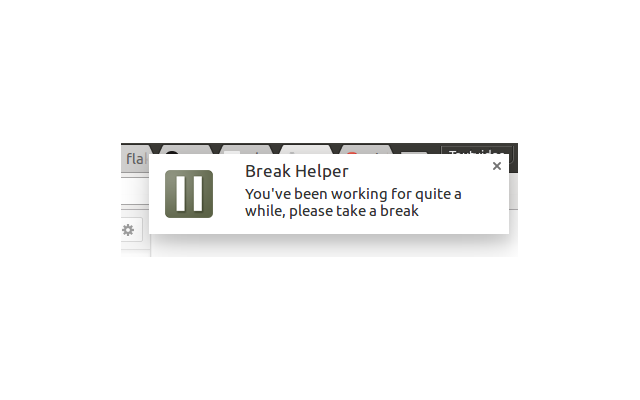 When it was time for a break, Break Helper would simply display a notification “Hey, time’s up. Time for a break!” and would automatically go into a break mode without any user interaction. After break was over, it automatically went back into work mode. The problem with this approach was that it was too easy to ignore. I found myself completely ignoring it for days, and I skipped a lot of breaks, which is not good for my health. Instead, with the addition of button support to the Rich Notifications mechanism, I was able to add back confirmation buttons. That way if you’re still working, the notification won’t go away and will require user interaction. It’s easy enough to dismiss it by closing it or clicking “Skip this break”, but much harder to ignore it as it will stay in the corner of your screen. And, if you’re working on something important - it gives you a chance to finish your work. Once the break starts, it simply used to state “You’re on a break” without a clear indication of how much time you have left. Sound notifications were broken for a while, and they’re fixed again in 1.6 release. Also, I found the old notification sound too jarring. Previously BH used a sound clip of a ringing old school mobile phone, so this time I switched it to a less jarring “Solemn” chime I found on notificationsounds.com. Requiring a user interaction for when the break ends. Sometimes one may not notice when it’s time to get back to work, and once you get back from your break - 5 minutes of work time have already passed. It may be a bit too annoying for frequent breaks, but perhaps it would be worth asking for user confirmation to get back into work mode. Code. You can find Break Helper’s code on GitHub (flakas/Break-Helper), and it’s not pretty. It’s quite error prone and difficult to maintain. It needs some dev love to refactor the code and clean up old obsolete pieces. Graphics and sales copy on Chrome Web Store. It’s fairly outdated, not very clearly pertaining the purpose of this extension. So there’s still some work to do even on this very simple extension, but that’s a worry for 2017. However, I’m very happy to see that over 1000 users still actively use it (or ignore it). 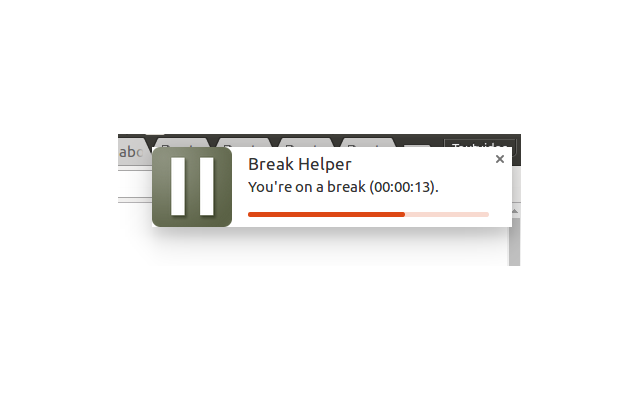 And if you’re interested in checking out Break Helper, you can find it here: Download Break Helper from Chrome Web Store. It’s Free!